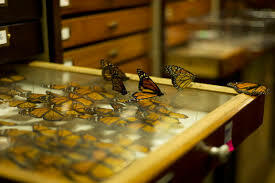 The Wake was filmed at the invertebrate zoology department of the Carnegie Natural History museum in Pittsburgh where there are old cabinets full of categorized butterfly specimens, neatly ordered in drawers. I released into this space 100 live butterflies that flew among the dead specimens, as if these dead specimens have now come to life. The work explores themes such as revolution, freedom, and the transition from sleep to new consciousness. A revolutionary awakening. The work is corresponds to the various revolutions that took place recently around the globe, such as in Northern Africa. Where the people decide to leave the ordered regime which has kept them dormant for year, to wake up and rebel, just like the butterflies which seemingly escape their glass dwelling cases.